It was by random chance that I met Jordi Viader i Soler who is one of those traveling enologs that bounces around the world, working on different harvests, but specifically the harvest at La Vinyeta in Catalonia, Spain. He had recently come back from South Africa where he had been working at Rupert Wines. 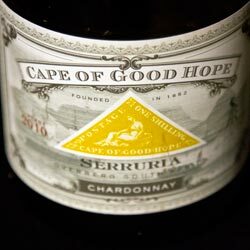 He just so happened to have a bottle of Serruria Chardonnay from their Cape of Good Hope line. While it had been opened a few hours previously, it was as I come to expect a Chardonnay not from California to be. The nose and body were full of fruit. It was floral yet not overpowering with a well-defined acidity that would place it well for meals. Most importantly though, there wasn’t a lick of oak to be found in it, but they do some short oak-aging. The trick is that it’s in older, used barrels. They give it a proper amount just to boost the tannins, but back off before you’re getting acorns up your nose while drinking it. An overall very enjoyable Chardonnay that is even-tempered enough for a great many occasions. Read up on more of these excellent South African wines in our Stellenbosch enotourism guide.